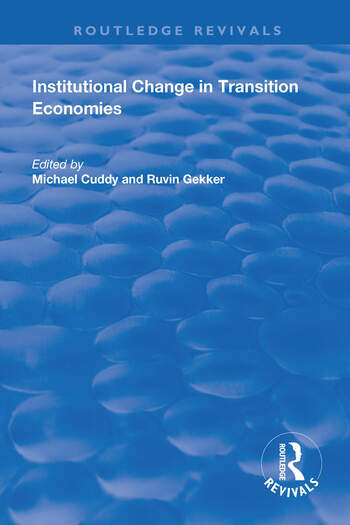 This title was first published in 2002.The importance of institutions for transition economies has so far been overlooked; Michael Cuddy and Ruvin Gekker bring together leading experts in the field to fill this crucial void in the literature. The contributors concentrate on an ongoing tension between informal constraints and mechanisms and the new formal rules and mechanisms that have gradually evolved through the transition period. Experiences are primarily drawn from Russia. The book consists of three parts, the first comprising an analysis, synthesis and generalizations of the institutional adaptations, as a market economy slowly emerges from a fog of shifting rules and varying interpretations. This is followed by the study of business and taxation authorities’ behavior as they try to minimize or maximize the taxation take. The volume also analyzes the challenges facing central and regional governments in delivering equitable levels of public services across regions of vastly different development levels, while at the same time trying to stimulate regional economic growth. Contents: Institutional Changes in the Russian Economy: The Russian economy: market in form but ’feudal’ in content?, Richard E. Ericson; Corruption and organized crime in the Russian transition, Jim Leitzel; Strong institutions are more important than the speed of reforms, Vladimir Popov; An evolutionary analysis of Russia’s virtual economy, Clifford Gaddy and Barry W. Ickes; Russia’s economic policy at the beginning of the new phase, Vladimir Mau. Taxation in Transition Economies: The tax system and the peculiarities of the Russian economy, Michael V. Alexeev; Soft budget constraints and tax arrears in transition economies, Ruvin Gekker; Effective versus statutory taxation: measuring effective tax administration in transition economies, Mark E. Schaffer and Gerard Turley. Regional Developments and Institutional Reforms: Regional disparities and transfer policies in Russia: theory and evidence, Era Dabla-Norris and Shlomo Weber; Regional development theory and policy: and example for Russia?, Michael Cuddy and Sarah Callanan. Index. Michael Cuddy, Ph.D. North Carolina State University Lecturer and Professor of Economics at NUI, Galway 1971 - present; Visiting Professor at University of Arizona, North Carolina State University and Pennsylvania State University, University of Rennes and University of Bonn. International Economic Consultant in Regional and Rural Development. Ruvin Gekker, Ph.D. University of California, Irvine Assistant Professor of Economics at York University in Toronto, Canada 1987 - 1995 Lecturer in Economics at the University of Wales, Aberystwyth, UK 1995 - 1999 Lecturer in Economics at the National University of Ireland, Galway, 1999 - present. Research interests include Public Choice/ Social Choice, Applied Game Theory and Economics of Transition.